...Serbian coach gets the nod for Black Stars job Accra, Nov. 24, GNA - The Ghana Football Association (GFA) has appointed Ratomir Dujkovic, a Serbian as the new head coach of the senior national team, the Black Stars. Coach Dujkovic becomes the 34th coach to handle the Black Stars and will assume responsibility on December 1, to prepare the team for the second round of the World Cup qualifying series, which begins in March, next year. The coach succeeds Portuguese national, Mariano Barreto who walked out of his contract with Ghana in midstream of the qualifying series. 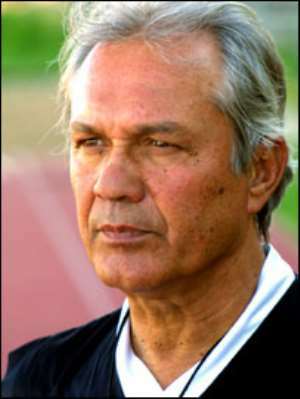 Dujkovic is on record to have guided Rwanda to its first Nations Cup appearance in 2004 but left after the team failed to advance to the group stages of the competition. His appointment comes after the failure of favourite, Philip Troussier to arrive in the country for interviews with the FA officials this week as well as his high salary demands of 22, 000 dollars a month. Mr Troussier, aside his high salary demand is also making an onward demand of 250, 000 dollars as an enticement fee before he assumes duty. The FA, considering the financial demands of the Frenchman in relation to its coffers decided to settle on the former Rwandan coach. Though the FA in a statement on the new appointment failed to mention the salary of the coach, GNA Sports sources reveals that Coach Dujkovic will earn around 18, 000 dollars a month, which is about an 80% increment over what former coach Barreto was earning. The Serbian is expected in the country by the close of the month to begin preparations for his new job. It would be recalled that over 40 coaches including four Ghanaians applied for the job of the head coach when Barreto left the scene after guiding Ghana to beat Cape Verde 2-0 in the World Cup qualifying series at the Kumasi Sports Stadium. The Black Stars will open the second round of the World Cup qualifying series against DR. Congo in March next year.